Alright! Today let’s talk about travel. I am sure most of us love to travel, explore new place, food, culture, shopping and etc… Great so we are going to continue with Part 2: Things You Must Do at Universal Studios Japan, Osaka. 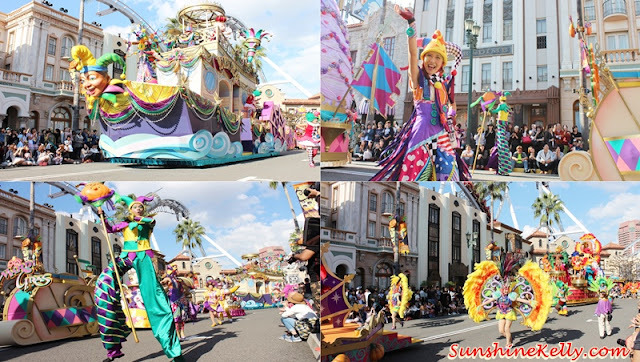 This time we are going to take you to the Parade de Carnivale and of course into The Wizarding World of Harry Potter. Remember I took a break after lunch at Part 1: Things You Must Do at Universal Studios Japan, Osaka. I am back, so after filling our tummy with the scrumptious lunch set at the Park Side Grille restaurant, we took a stroll along the Hollywood street and waited for the Parade de Carnivale to start. The Parade de Carnivale is inspired by the Street Carnival in Rio de Jeneiro. It was full of vibrancy and upbeat with lots of people, music, dance and colors. Everyone was in the jubilant mood and ready to party. Here are more photos of the carnivale. Hey these Minion Popcorn Bucket is too adorable, that time they have the Dracula selling at 3000Yen and the Original selling at 2480Yen. Although is not cheap but it’s selling like hot cakes, as you can see many queue to buy. They are too adorable. If you are a Minions Fans you might want to stay for this show at 4pm in front of the Minions Mart. It’s about 30 minutes show with the Minions singing, dancing and some comedy. Usually I don’t take such roller coaster but since I am in Universal Studios Japan with friends and they are urging me to try it. Set! I will do it, me and Nisa are afraid of heights actually. It was about 3 minutes ride like flying through the sky. We can also choose the soundtrack as background music to keep up calm, I guess. I survived the 3 minutes and did not vomit after that. This was an unbelievable thrill and exhilaration in this new sensational roller coaster. I am glad that I tried it. Finally we arrived at Hogwarts! Are you a Harry Potter fans? 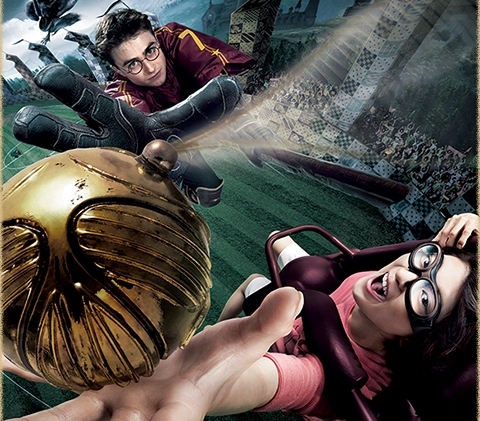 The Wizarding World of Harry Potter is the first in Asia and another one is in Universal Studios Florida. As we entered through the massive castle gates and enter Hogwarts School of Witchcraft and Wizardry we passed by the Owl Post and Owlery, we saw the Hogwarts Express, Honeydukes and many more like in Harry Potter movie. Oh yes before I forgot, you must visit the Ollivanders also, it’s a small dusty shop where you can see and buy the wizard wands. We are going to enter the Hogwarts Castle now. Jom! But the sad thing is that we are not allowed to take any photos inside. I can only share my experience with you perhaps you can check out some of the photos at Universal Studios Japan official website. Inside the castle are the replicas of the Hogwarts, its chill and the light is dimmed. We first passed through hallway and into the dungeon then the talking portrait gallery, Mirror of Erised and the Hogwarts House Jewels. Then Dumblebore projected above his desk to welcome us. Then we go through the Dumbledore’s office and the Gryffindor common room. In the Defence Against the Dark Arts classroom, Harry, Ron, and Hermione appear from under the Invisibility Cloak, urging guests to meet them in the Room of Requirement in order to sneak everyone down to a Quidditch match. After the tour inside, we queue for the Harry Potter and The Forbidden Journey in 4K3D. It is one of my unforgettable rides, I can see Harry Potter and Hermione so near as if I can reach out my hand to touch them. It’s the world’s best attraction which uses state-of-the-art 4K technology and is now in 3D for the first time in the world. We followed Harry Potter and Ron Weasley around Hogwarts' buildings and towers to a Quidditch match. It sort of like roller coaster ride, as Harry and Ron travel under a bridge and Hagrid's pet Hungarian Horntail dragon begins to chase us. We descended into a set of the Forbidden Forest where we encounter a figure of Aragog a large, sentient spider who spits water at us. The rest are like what you can see in Harry Potter’s movies. Every second was so intense. It definite a must take rides when you are in Universal Studios Japan its magical journey full of thrills and excitement is sure to be unforgettable. This is located behind the Hogwarts Castle overlooking the serene Great Lake. As you know Three Broomsticks is a long-established tavern in Hogsmeade, favoured by teachers and students of Hogwarts School of Witchcraft and Wizardry. They served the Butterbeer a popular drink in the wizarding world. This is a sweet, non-alcoholic beverage, reminiscent of shortbread and butterscotch, can be enjoyed by children also. The Butterbeer is only available at the Three Broomsticks and the Hog’s Head. Had a rest at the Three Broomsticks, continue to take photos and hand out at the streets while waiting for the Frog Choir to start. I enjoyed the harmonic songs by a choir of Hogwarts students from Gryffindor, Slytherin, Hufflepuff and Ravenclaw performing a range of familiar wizarding songs accompanied by their talented croaking frogs. There are many souvenirs shops available. These are some of the shops that I visited such as the Universal Studios Souvenirs, Minion Mart, Horror Shop, Filch's Emporium of Confiscated Goods at the Wizarding World of Harry Potter and The Amazing Spider-Man Store. There are many more shops. Basically these are the spots and activities that you should do when you visit Universal Studios Japan, Osaka. Of course if you have more time you can go for all the rides, shows and attractions. To know more about the Universal Studios Japan entrance fees, how to get there by train or bus you can check out the details on my Part 1 blog post HERE. You can also compare and search for your next hotel stay on HotelsCombined. What do you think of Universal Studios Japan? If you are in Osaka will you go? What is your main attraction to Universal Studios Japan? Wow! So happening at Osaka. Dear I wanna grab the minion from your hand. OMG! I really really want to go to Osaka for the wizarding world of Harry Potter. So envious right now! wow~~ airasia sponsor you to the Japan! HOpe i can be like that in the future too. I want to join into the world of Harry POtter! Everything that happen in the movie including the 4K3D thing! so happening in japan & uss! i going to visit one day as my hubby is a harry potter fans ! Oh gosh! So jealous. It looks like so much fun! I totally want to visit the Harry Potter attractions. i'll scream if i ever had the opportunity to travel all the way to osaka. :) looks damn fun ! My kids will sapu the minion popcorn bucket if we were there. Looks fun and exciting too. Looks like a heaven for my Little Angels. Will bring them there to see their favourite Minion. Its sad that my last visit to Japan was just before they opened the Harry Potter Themepark. CRIES! more reasons to be back there again. The Harry Porter's castle is so huge and it look so real. So many things to explore at Universal Studio in Japan. I thing need to use the whole day to explore Universal Studio. Wow! What a fun adventure! So lucky! I wish I can go there someday! Hi SunShine Kelly, did you bought the express pass in order to get into the Harry Porter rideS? Hi Xenoirita, yes its better to get tghe express pass if not you will be wasting a lot of time queuing. Even on the weekday and non holiday season there were also crowds.